Flip dies but Samsung enters pocket HD market to take its place. Samsung will showcase its under-water video talents with the newly unveiled W200 pocket HD camera, which promises full 1080p hi-def footage in up to three metres of water. The W200, which is a direct rival to T3 favourite the Kodak PlaySport, is also shockproof to 2m with a rugged red coating that reflects its positioning as a tough on-the-move device. The device, which has a 2.3-inch LCD screen and an F/2.2 lens, also boasts 5-megapixel stills to go alongside the 1980x1020p 30 frames per second video. The device also offers to opportunity to pause video recording and restart using the same video clip, which will probably come in handy when you're filming underwater. Unless you're a fish, you're going to have to come up for air eventually. Video footage will be stored on an SD or SDHC card, while there's a HDMI port to enable you to play back your video creations on your hi-def telly. 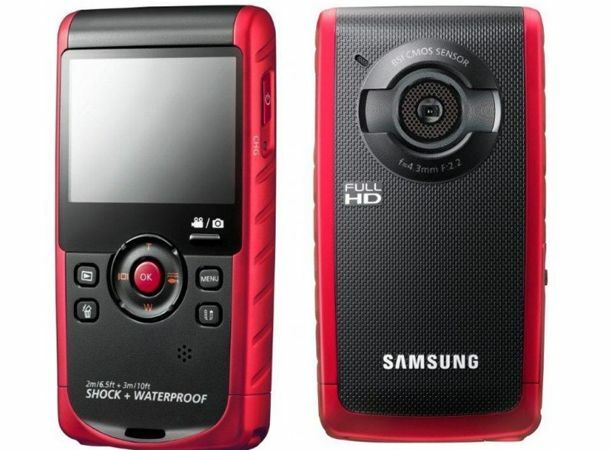 With Cisco folding its once-mighty Flip camera division last week, it seems the pocket HD cam is heading very much in the direction of the convenient holiday-proof devices like the Kodak PlaySport and now the Samsung W200. The device will be out in the US in May for $159. We're awaiting UK pricing and availability.